GL Communications Inc., announced today its enhanced Voice Quality Testing solutions. GL's VQuad™ software is enhanced to support Four Dual UTA's on a Single VQuad™ system which allows up to eight devices configured simultaneously, performing voice quality testing along with a variety of other analytical tests. He added, “GL's VQuad™ software is enhanced to support Four Dual UTA's on a Single VQuad™ system which allows up to eight devices configured simultaneously, performing voice quality testing along with a variety of other analytical tests. Supported Dual UTA interfaces include 2-wire FXO, Bluetooth (including support for VoLTE), Balanced, Mobile and Push to Talk (PTT). 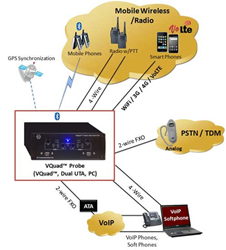 Typical networks supported by GL's VQuad™ - Dual UTA hardware/software include Wireless (VoLTE, LTE, 4G, 3G) via Bluetooth or wired headset, Broadband Internet (LTE, 4G, 3G), VoIP SIP, PSTN, and TDM. "Automated testing using GL's VQuad™ includes the ability for scripting with variable parameters for improved flexibility, portability with mobile drive testing, and remote accessibility using CLI or WebViewer™. Mr. Bichefsky further added, “VQuad™ supports new Video Conference Testing using the VAC (Video Application Controller) for both manual and automated (scripted) tests. For redundancy and load sharing, VQuad™ and File Monitor and VQT support connections to as many as four remote Central Systems. Full access for modifying these connections (along with any VQuad™ related configuration) is available directly from the WebViewer™. Enhanced VQuad™ remote functionality supports most all available commands. "Enhanced WebViewer™ now includes a consolidated console view to monitor virtually all results including VQT, VQuad™ and NetTest from a single screen. This view can be customized adding additional events and threshold levels making the Console a one-stop-shop for Network Analysis. "The WebViewer™ Network Status is enhanced with improved look and feel (especially remote operations) along with additional functionality. Network status is provided for ALL VQuad™ Nodes, ALL VQT nodes, ALL File Monitor nodes and ALL Mobile connections. In other words, from the WebViewer™, the user can see exactly what’s happening within the entire network and control and change settings on any node connected to the central system. Within Google Maps™, WebViewer™ supports pinning the NetTest results with Start/Stop Timestamp and GPS. In other words the user can easily determine when/where the test Started and when/where the test Ended (along with whether the test Passed or Failed based on preset thresholds). WebViewer™ includes several default configurations for use with Google Maps™.